Today’s interview about the family centered c-section option is with Liz Wilfong, D.O. I am so very grateful she decided to try a family centered c-section. Her willingness has changed the level of care for women at the hospital she serves. She is a sweet spirited doctor who cares about her patients in every way. Be blessed by her amazing testimony! I’m currently practicing obstetrics and gynecology at Petersons Women’s Medical Associates in Kerrville, TX. I do all my deliveries out of Petersons Medical Regional Center. I’ve been practicing ob/gyn for three years now. So I thought I was up to date on the lastest in my field. But I was wrong! And good thing too because it’s obvious that we needed improvements in certain areas. I was unsure how this would affect the sterility of the procedure and my ability to complete the c-section in a safe manner. I was envisioning being jostled about with a needle in my hand as the newborn was taken care of at the mother’s chest. I was skeptical about it working well. The motivation behind doing this was a couple who had lost their child during labor. An emergency c-section was done in an effort to save the child. During this event the father and mother were separated and the mother was placed under general anesthesia. They never again wanted to be in a situation where they were disconnected from each other or their baby. What are the challenges of a family centered c-section, from your role? The challenge lies in communicating with all members of the team, from the surgical assistants to the pediatricians. Everybody’s roles are redefined in this new scenario. Everybody must buy into the benefits this provides to the parents. The main change has come in introducing a sterile bridge between the open incision and the mother. We currently use the sterile blankets/towels that the pediatricians held to receive the baby. This allows for a good hand-off and helps keep the drape sterile that we then pull up again to continue with the rest of the procedure. The immediate benefits are relief, joy, bonding, and a sense of celebration. On the medical side it appears that the patients require less pain medication, maybe because their focus is on their baby. The first family centered c-section I did was really a run-through before doing the one for Erin and Blake. The couple was really looking forward to being the “guinea-pig”. The glow on her face as she held that baby sold me on this procedure and I became really excited that this could be the experience that awaited Erin and Blake. It was amazing to see the joy on their faces. It made me think that they were finally able to participate. Like this whole time they were by-standers in their own delivery and they had finally been invited in to what was always theirs! The two times I’ve done this its brought tears to my eyes. Very much how I feel in a vaginal delivery. What surprised you most about the family centered c-setion? I was most worried about the anesthesiologists acceptance of this because once we hand off the baby their space is invaded by nurses. But they actually were very receptive to this and I was surprised to see one anesthesiologist taking pictures! How would you describe the atmosphere in the OR during a regular c-section as compared to a family centered c-section? I think the main difference is that there is more focus on the couple. They are participating because they are receiving the baby to the chest and involved as interventions on the baby are completed. The couple has an active role versus a passive role. Also, the atmosphere feels more celebratory. Why do you think family centered c-sections are an option other medical professionals should consider for their patients? This is an option because it can be done, and it can be done in a safe manner. It does not interfere with the medical care of the patient and in many ways it improves the care of the patient. Not only do they seem to require less medication but their mental health is improved. How has being a part of family centered c-sections affected you personally? It makes the experience more personal. I feel better connected to the patients. I’ve also seen the good it’s done for older women who did not have positive delivery experiences back when medicine was more paternalistic. I recently had a patient seek me out for a routine exam just because she had read Erin and Blair’sstory and knew that I was the doctor involved. She had suffered a stillbirth and was never offered the chance to see her baby. To this day she doesn’t know what happened to his/her body. The idea that this procedure could bring a mother and child together as soon as possible I believe was healing to this patient. She told me she wanted a connection to this story so she came to see me. 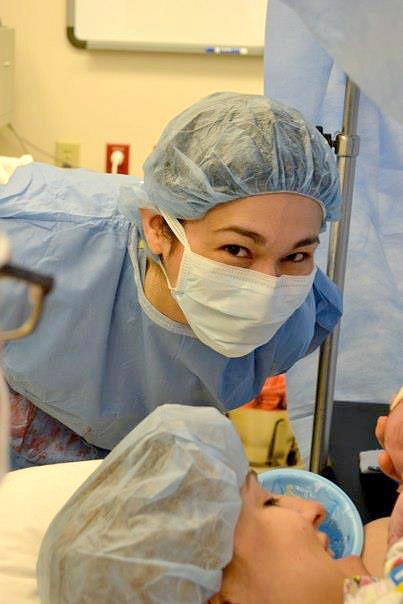 I was blown away by the impact this simple change in a routine c-section had on this woman. Amazing, right? Every OB needs to read this testimony to care and compassion. I’m thrilled! If you want a family centered c-section, or aspects of it, send your doctor this link or print out the post and bring it to her/him. Also, buy my book: Make the Most of Your C-Section: Preparing for a More Natural & Personalized Birth. Take advantage of my six c-sections experience as well as my passion for making c-section deliveries beautiful stories! The book will be released very soon!